James was christened in the parish of Ardtrea nad Desertlyn (Moneymore) on April 19, 1829. based on his later declared birthday, he was likely born April 4, to Sampson Harbison and Rose née Donnolly. Residence was indicated as 'Ballyneal'. He is likely one of the 6 male inhabitants claimed on Sampson's census return of 1831. We know nothing of his childhood; simply that he emigrated to America. The most plausible immigration record for James is on the Sir John Campbell, arrived New York July 7 1846, from Liverpool. He is listed as age 18, and a laborer. 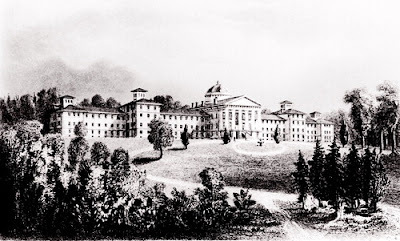 In the 1860 US census (August 28), James is listed as a laborer at the New Jersey State Lunatic Asylum (pictured above) in Ewing Township, NJ. On the return, there is also a Mary Warrington (age 27), who is designated neither an employee nor an inmate. She immigrated through New York in 1852; she was born to Thomas Warrington and Catherine Gillick in Cavan in 1833. James' marriage to Mary Warrington on May 30, 1861 in Trenton, NJ, records his parents as Sampson and Rose Harbeson. This might be a transcription error, or a result of illiteracy. By the 1870 census (dwelling 280; Trenton 3rd ward), the couple had had five children -- Charles (age 8), Mary (age 6), Sarah J. (June 10 1865-April 15 1917), John (age 2; born February 8 1869) and Thomas (age 5 months; born January 1870). Mary and Sarah J. are recorded as Pennsylvania births, while the others are New Jersey. All five children married and had issue. James' draft registration in June 1863 is in Woodbury, PA, alongside Henry K Harbison, two years older (who was likely a brother) and on the same page as Henry Harbison's son William. So apparently James was temporarily in Blair Co. from 1863 to the end of the Civil War. mary Warrington Harbisopn died in 1871. James married again, to Eliza Cronin (b. c 1841; Ireland) on April 11, 1875, again in Trenton, NJ, but she died a little more than a year later, likely in childbirth. James lived in Trenton, according to the city directories, until 1876. James was living with his son Thomas in Philadelphia, on 2213 Palethorp St., in 1900, according to the census, and with his widowed daughter Mary Harbison Fennen in 1910, at 2151 N 34d St., a boarding house; this census lists his year of immigration as 1846. James died on February 12, 1912, of myocarditis. His address was given as 2110 N 2nd St, 19th ward, which was the address of his daughter Sarah J McClernan; occupation was watchman. James was buried in New Cathedral Cemetery, Philadelphia, in the same plot as Charles Harbison, a nephew. The year of his death is misstated on both death certificate and headstone; as I've often remarked, 19th century people knew their birthday, but not always the year they were born. His father is also misstated as 'Henry'. Since James was a widower, it's possible his uncle was mistaken for his father.